The story of a young Coupe with Two Kids after the 1980 coup in Turkey. A story describing Turkish narcotic police team named "Pars" who are trailing the traffic through Afghanistan, Turkey, Europe and USA. Loyalty between two friends is stretched to its limit by one's deception. Their parents came to Germany as guest workers - and stayed. They opened Kebab stands and shops, had cars and families. Of course, many "guest workers" didn't want to go back to Turkey. They stayed. Their children grew up in Germany - speaking Turkish at home, with their friends, stuck outside "normal" society. This film examines a small part of the german-turkish counterculture, the part most suitable to a feature film: Its dirty, heroin-abusing, violent underside, the steet "kanaksters" (kanak gangsters). Ertan (Luk Piyes), the main character, is a charming (if brutal) small-time criminal: Heroin dealer, grocery robber, not-quite pimp. The film is told in a series of interlinked vignettes, structured as if they were memories or stories told by Ertan, conveniently in chronological order. 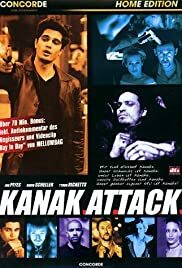 Kanak Attack has a fast pace, uses various editing trick to good effect and shows a form of counterculture that few people ever experience from the inside - unless they are from the german-turkish working-class ghettos.